WASHINGTON, DC -- Viktor Yanukovych is a man in a hurry. And whatever one’s political persuasion, the Ukrainian President’s first weeks in office have been a tour de force. He has moved quickly to create a legislative majority, a new government, consolidate power and re-establish the informal predominance of the presidency in Ukraine. No less impressive has been the dynamism he and his team have displayed in international affairs. This energy and momentum were in clear evidence in Washington, D.C., on April 11-14. For a short visit whose primary purpose was participation in a nuclear security summit with 46 other government leaders, Yanukovych’s schedule was unusually rich and substantive. He signaled his skilled team’s ability to advance Ukraine’s interests in a crowd. Significantly, he secured a bilateral meeting with U.S. President Barack Obama, one of only a handful such meetings with the American leader. The meeting occurred because Ukraine remains an important U.S. priority. 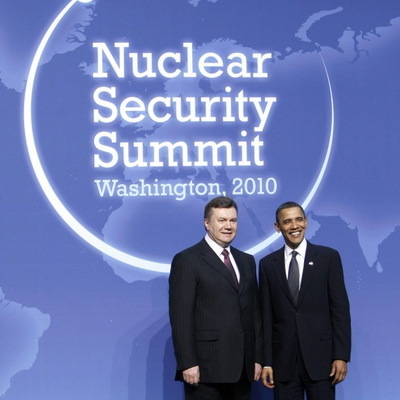 As importantly, it happened because Ukraine’s president had come with what in D.C. parlance is called a “deliverable:” Ukraine’s agreement to relinquish its remaining stockpile of highly enriched uranium. In this matter, Yanukovych resolved an issue that had remained unsettled for a decade and a half. For U.S. administrations that have lived through nearly five years of frustration with Ukraine’s political stalemate and policy deadlock, preceded by two years of scandals involving ex-President Leonid Kuchma, this was a refreshingly impressive accomplishment. The agreement signaled the emergence of a Kyiv that is not only rhetorically committed to cooperation, but one that can achieve tangible results. At the same time, the agreement on uranium was a sign that Yanukovych is aiming to maintain a balance in Ukraine’s relationships with Europe, the U.S. and Russia. Strong and pragmatic relations with the U.S. – as with Europe – are essential for the new Yanukovych team, which understands that U.S. support is crucial within international financial institutions. The visit also suggests that Yanukovych appears to understand that Ukraine will have a stronger hand in shaping its relationship with Russia in the context of deepening relations with Brussels and the Washington. In addition to participating in the summit and meeting with Obama, Yanukovych held talks with International Monetary Fund managing director Dominique Strauss-Kahn. The Ukrainian president paved the way for the upcoming visit of Deputy Prime Minister Sergiy Tigipko to the World Bank-IMF annual gathering. He also held bilateral discussions with Chancellor Angela Merkel of Germany, President Nicholas Sarkozy of France, Prime Minister Manhmohan Singh of India, President Hu Jintao of China, Canadian Prime Minister Steven Harper and Prime Minister Recep Tayyip Erdogan of Turkey. No less energetic have been his other foreign travels, which have included an early trip to Brussels that yielded the most concrete official expression of Europe’s commitment to Ukraine’s eventual membership in the European Union, as well as two “atmospheric,” rather than substantive, visits to Russia and one to Kazakhstan. To be sure, there are strong advocates inside the Party of Regions and among its coalition Communist partners, of a tilt toward Russia. But the early signs are that Yanukovych is resisting these lobbies and is seeking to create a genuine equilibrium that will allow Ukraine to protect its sovereignty as he works to rebuild the economy and move the country toward the aim of eventual membership in the European Union. Ukraine’s president is yet to be tested by conflict or crisis. And his efforts to maintain equally friendly relations with Russia, Europe and the U.S. may in the end prove unsustainable. It is also an open question whether Ukraine's security neutrality can be sustained and its security ensured solely by relying on its own defense capabilities. While one swallow does not a spring make, the early weeks of Yanukovych’s presidency –and his U.S. visit – suggest that Ukraine’s international relations are moving forward in a balanced fashion. So, too, are the first indicators of Ukraine’s commitment to economic reform, fiscal stability and cooperation with international financial institutions. Such pragmatism creates some hope that Ukraine’s new president will in the end also pursue a similar tack on matters of national identity and reject the divisive cultural and linguistic agenda being pursued by some in the current government. These, at least, are the hopes and signals that come from a substantive and successful first foray to a city that is one the centers of our globalized world.